I found him studying this 1937 text I’d given him. It was retrieved from the dump, and had all kinds of cool historical stuff in it–like how Napoleon funded (and bankrupted himself) trying to accelerate the refining of the hyperpricey aluminum fabrication process. In his day, only royalty could afford aluminum, so they got to have cool aluminum cutlery while their friends just made do with gold and silverware! Also learned that the discovery (as with so many things) was happening in Oberlin, Ohio and in France by separate young chemists. After this photo, we pitched the book in the thrift shop pile. ~ by jacquiephelan on June 14, 2011. 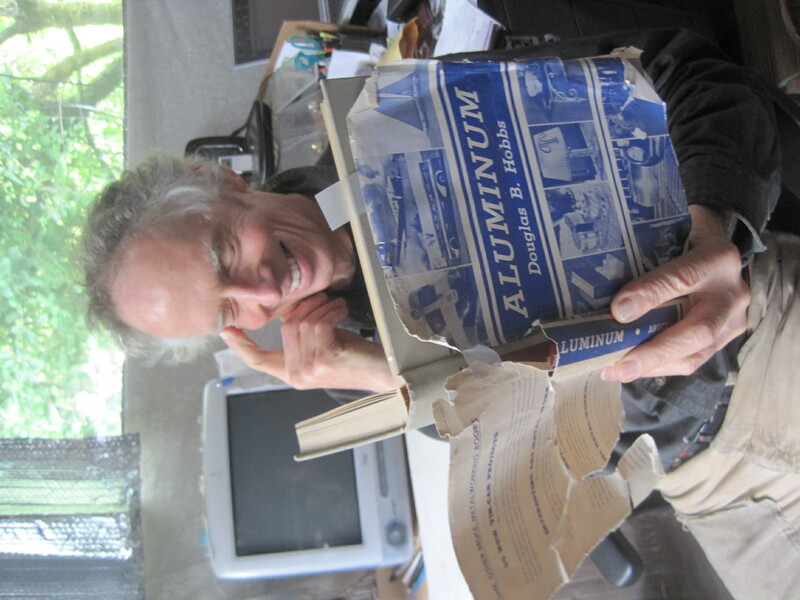 Aluminum Books always make me chuckle, too. What’s that Etch-A-Sketch thing in the background? One of the ways that I track my ongoing Aussifcation, as opposed to ossification which is also preceding apace, is how self conscious I am about using Aussie pronunciations. It took me almost two years to be able to add that extra “i” in aluminum without a conscious effort. I mean, these folks take letters OUT of almost everything, why add one to a word that already has its fair share of letters? Right now I’m struggling with tomAYto and tomAHto. I’ve sworn that it’ll be a tomAYto until I die but that short vowel keeps creeping in. I love that sort of book. I’m the worst sort of pack-rat nerd, especially when it comes to books. An occupational hazard from running a used book store for 20 odd years I suspect. I have a shelf in the shop where I keep things like The Custom Bicycle (1979) by Kolin and de la Rosa, both first and third editions of Bicycling Science by Wilson and Whitt and a Sturmy Archer catalogue/ tech manual from 1978. I’ve many other such tomes of greater and lesser usefulness still packed in a box somewhere that will join their brethren in dusty solidarity just as soon as I find them. what a great picture! Is oxymoronic a word?